I dedicated my doctorate to my father. He was an extraordinary man. He could charm birds from trees, living what we would today call a ‘colourful life’ which was a scant half step ahead of the law. He had a tattoo parlour outside the Dockyard Gates in Portsmouth, a disreputable caff with a busy set of women employed (not by him I hasten to add) entertaining naval personnel above it and a huge business in slot machines. He sent me to a posh girl’s school and paid the fees in coins. From an early age, I wanted desperately to be a doctor and had five places to read medicine, but my father became ill during my A level year and died of cancer shortly after my exams. So, he died assuming that his daughter was going to be a doctor. In fact, I narrowly missed the grades I needed but was still determined to go to University (the first in my family) and to do science, which was always my first love. It’s taken 40 years to become a doctor, but I suspect my father would have been inordinately proud – although would have no doubt yelled something incredibly inappropriate just as I received the scroll. He terrorised my headmistress and once managed to get her to demonstrate a pogo stick in front of a large crowd of incredulous parents by dint of waving a huge wodge of cash at her and saying, ‘This for the swimming pool fund (and it was a vast sum in its day which he’d won on the horses that morning) if you get on this pogo stick’. Embarrassed? I could have died. I did also mention to the assembled graduates – congratulations to you all by the way – that I felt that at any moment, my Form 1 maths teacher, the hated Mrs Glass, would appear and demand that I stopped being so silly. Would I just come down from that stage? I was ashamedly bad at maths and thought that if you were clever, you could do maths and I couldn’t, so I couldn’t be clever. So, I’ve lived my life – which hasn’t been without success – thinking almost daily that I’m about to be revealed as a complete fraud and found out. As I’ve got older, I have realised that imposter syndrome is much more widespread, not just confined to women although I think more prevalent amongst them and certainly not simply to those challenged by sums. Perhaps we all spend our days thinking ‘how did I get away with that’? It certainly doesn’t diminish that much with age, but I advised the St George’s graduates that they needed to keep a herogram file. Every time – and there will be many occasions be sure – that someone says, ‘Great job’, stick the details into your secret herogram file on your phone. Then, when you are feeling really wimpy, just click on the file and there will be an extraordinary number of people telling you how great you are. They can’t all be wrong. I ended my address by saying that you must be careful how you use that Dr in front of your name. I was on a plane recently when the flight attendant came up to the man next to me and said ‘Sir, I see from the passenger list that you’re a doctor, there’s a lady with a problem back there, can you help?’ ‘Only if she’s rusting, I’m a doctor of metallurgy’ said my new best friend. 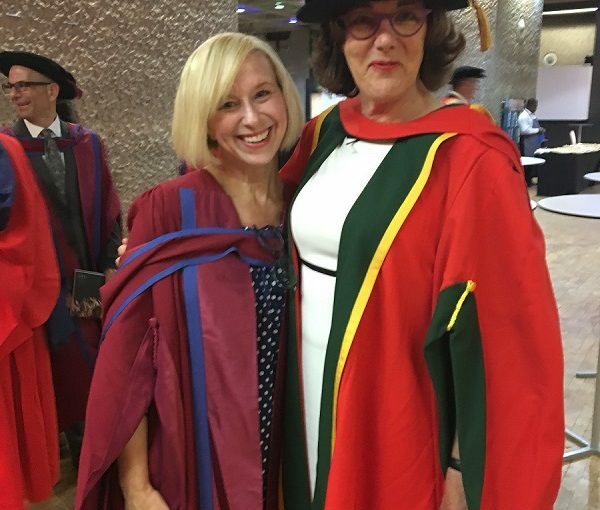 I felt deeply honoured and thank you to Jenny Higham, the Principal and to my great chum Dr. Deborah Bowman, who introduced me, and indeed to everyone at St George’s Medical School.